Need more information about booking Home 8571589 ? 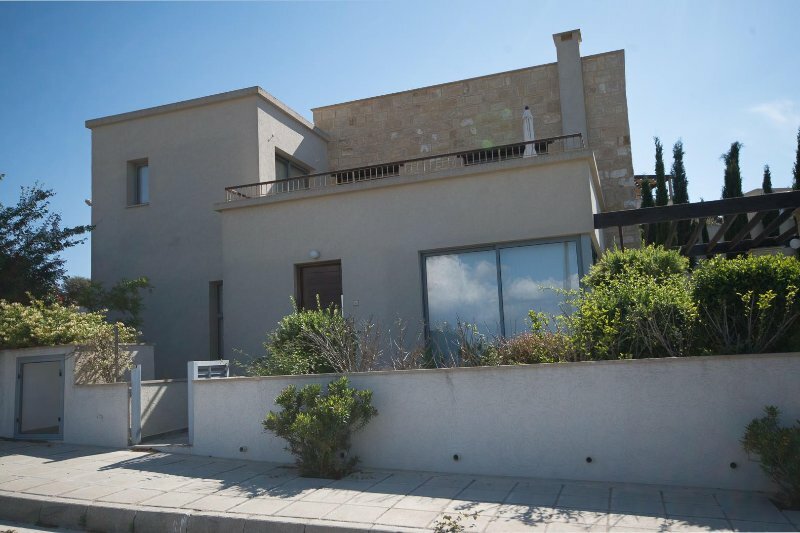 This 3 bedroom villa is ideal for those wishing to explore this area of Cyprus including the renowned turtle beach at Lara Bay. Located on the spectacular Akamas peninsular, you are assured of wonderful views of the coast. The villa offers a spacious open plan kitchen and living room with patio doors that lead to the gardens and private swimming pool. On this floor there is also an en suite bedroom. Two further en suite bedrooms are upstairs, both of which have access to a large balcony area overlooking Chrysochous Bay. The kitchen is fully equipped with everything you will need to enjoy your stay including: Oven, fridge/freezer, microwave, toaster and kettle. The handy utility room has a washing machine as well as an iron and ironing board. The lounge area has sofas and coffee tables and boasts internet TV. The dining area has seating for 4 people. Air conditioning and WiFi are also available. All linen and towels (except beach towels) are provided. Outside in the garden area, in addition to the private swimming pool, you will find a pool shower, well tended gardens and a gas BBQ for those al fresco meals. Plenty of tables and chairs are available and sunbeds for the sun worshippers. Off road parking for two vehicles. A car is essential as this is a rural villa. The nearest village is Drouseia where you will find a small supermarket and a few restaurants. All other facilities can be found in the resorts of Polis and Latchi, which are both within easy reach. Polis derives its name from the Greek word for city, and is the short version of Polis Chrysochous which translated means City of the Golden Land thus named for the fertile land surrounding the river Chrysochous. There are no large hotels here, so travellers can step into a world away from the usual tourist attractions and enjoy the peace and tranquillity of this small but attractive town. The main feature of Polis is the local square with many open air restaurants offering tantalizing home baked cuisine, cosy bars where thirsty travellers can sample locally made wines and beers; souvenir shops, banks and jewellers. Ice cream parlours and tiny coffee shops are just a couple of the other delights on offer. Latchi is a small fishing village situated just 2 km west of Polis. Before it was discovered by tourism, the main industry, apart from fishing, was exporting sea sponges. The main focal point of Latchi is the harbour with fishing boats bobbing gently on the clear waters weighed down with nets, wicker baskets and the catch of the day. Fresh fish can be sampled in one of the many small stone built tavernas surrounding the harbour; a popular eating place for the locals. Sun worshippers and beach lovers will appreciate the sandy and pebbly beaches nestling along the coastline of Chrysochou Bay. Clear waters and gentle summer breezes await you! Walking enthusiasts will love the many walks available in this area including the trails of Aphrodite and Adonis. Explore the Baths of Aphrodite where legend has it that Aphrodite bathed with her lover Adonis, and enjoy the unspoiled scenery of the peninsula and the Akamas National Park. During spring time the scenery is at its best with an abundance of wild flowers, orange and lemon blossom, wild lavender, basil and poppy fields. You will be met by Carol our English representative who will show you to the villa. Having lived in Cyprus for 13 years, she is a mine of information for local amenities and is available 24/7 in case of emergency. This place is simply amazing - a stunning contemporary property in a beautiful location! It’s set in a small exclusive cluster of 18 villas with pools and had the most stunning views across the hills and of the bay below. The furnishings and equipment were by far the best we’ve experienced. The pool was spotless and surrounded by beautiful gardens (both were maintained during our stay). We used it as a couple but with 3 double bedrooms (all ensuite) and loads of wardrobe space we’ll definitely be back with our family soon! There’s loads of kitchen / dining and living room space. We didn’t use the tv but it was internet based so would be great for families. I also noticed Netflix was available!!. There was space to sunbathe together or take some time out on the upstairs terrace overlooking the bay. The pool is a sensible depth for families (I’d say it ranged from about 1 to 1.7m (but do check). Reason for mentioning is some other owners had very deep pools of about 1.8m throughout which may not be suitable for everyone. I can’t speak highly enough of this place or the owners and property management company where Carol and her excellent team were superb in arranging our stay. It gave us the best of both worlds as a place in the country yet only 15/20 min drive to Latchi and Polis to enjoy the marina, beaches and sea front tavernas whenever we pleased. The nearby village of Droushia (2.5km) had two fantastic local tavernas and a shop like a small Aladdin’s cave! We opted to pick up many of our supplies here which included village eggs, chicken, potatoes and home made halloumi. Finally the outdoor furniture and seating areas were outstanding quality and meant we rarely sat inside! We’ll be back for sure and recommend this place in a heartbeat. I’d give it 11/10!!! It’s that good. Owner's reply: Hi George. So glad you had a fabulous stay and loved the villa, it is really great. Look forward to welcoming you back with the family soon. If you’ve already booked, go to Manage your holiday booking to view Carol the owner's contact details or send them a message. Or send Carol (the owner) an enquiry through the Contact the owner/manager form if you’d like a quote or more info first. When you pay online through the Book your stay form, a booking request is sent to Carol (the owner). You’ll find out within 24 hours whether they’ve accepted - no money will leave your account before then. You can also request a quote from Carol (the owner) through the contact form. The owner will email you the total cost for your dates and a link to book and pay online. Use the Book your stay form to pay provisionally online. You can pay by credit/debit card or PayPal. Carol (the owner) will have 24 hours to accept the booking and no money will leave your account before then. Why can't I call Carol (the owner) before booking? You’ll need to contact Carol (the owner) to do this. Send them a message in Manage your holiday booking or through the contact form on this page. You can request to change the dates or number of people on your booking via the Manage your holiday booking page. To change your holiday dates use the Edit booking button. If you need to change the number of guests staying then send Carol (the owner) a message. If Carol (the owner) agrees, they’ll send you a revised quote outlining the changes. You can review and accept/decline this from the Manage your holiday booking page. You’ll have 48 hours to take action before the revised quote expires.